The easiest way to add the crunchy, flavorful taste of crumbled, hickory-smoked bacon to your favorite recipes. 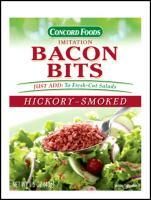 Try Concord’s Bacon Bits on salads, baked potatoes, stuffed tomatoes and vegetable casseroles. Add a 1.5oz pack to soups, sauces or dips, or any recipe that calls for crisp, crumbled bacon.